Balancing Jane: Sadly . . . I was hoping that there was no way this was real, but after some research, I think that it is. Nettleton Middle School in Mississippi sent home documents with their students telling the students how to apply to be candidates in upcoming school elections (president, vice-president, reporter, etc.) This middle school, however, decided that they needed to divide up the potential slots by race. This woman's daughter was told she couldn't apply to run for reporter because it was reserved for black students, but she could run for president because it was reserved for white students. While I don't know if this makes the story "worse" per se, I was particularly disturbed by the fact that this student is actually biracial. When the mother called the school to ask how her daughter was supposed to be categorized she was allegedly told that they "[g]o by the mother’s race b/c with minorities the father isn’t generally in the home." As a human being, the fact that this type of blatant racism still persists disturbs and enrages me. As a scholar who studies the rhetoric of difference, this document clearly labeling each position as "white" or "black" fascinates me. (Disturbing enough that we label people in this way at all, but even more disturbing that we think all of the diversity in the world can be summed up by these two categories.) As a woman carrying a biracial child, I am frightened for the implications occurrences like this one have for the future of our society as a whole and my daughter in particular. Edit: Apparently, my original link isn't working right now. Here's a new one at Gawker. Wow and I thought people from my small, rural hometown were bigoted. (They are, but not this blatantly). I would say that some phone calls and letters from students, parents, and concerned people from all over are in order. I don't live in Mississippi, not anywhere near it, but those students are our future, and I would like our country to keep making strides against racism. 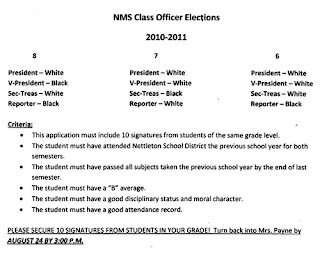 The school probably thinks these actions aren't racist as they are reserving spots for those "poor fatherless minority students." (I hate that you cannot put any sort of inflection into type, but I'm going to leave that last statement anyway, you may remove it if you deem it inappropriate). I sincerely hope that your daughter does not face such difficulties. She should not have to be the "diversity lesson" for her peers. I agree completely. Though I keep finding different parts to call the "most" disturbing, I am particularly appalled at the fact that someone actually thought this policy helped promote diversity.